She is a fickle mistress; Mother Nature. One day the Snowdrops are blooming and the sun feels warm and spring like. The next morning the ponds are frozen over again and walking the dog at -8 seems somewhat less than appealing. That’s the month of March in my little corner of the world. The accumulated snow has mostly disappeared but returns in short nasty reminders. The constant freeze - thaw cycle without the snow protection does more harm to the garden than any long cold winter. The few warm days start to break the winter dormancy of many things and then “gotcha” the freeze attacks. I could take up knitting instead of gardening and then all those problems would melt away, along with the beautiful flowers, tasty vegetables and the sheer joy of having helped them survive another March. My garden’s indicators of spring are confused. 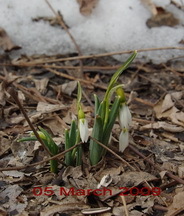 The Snowdrops bloomed on the fifth and in previous years it has been at least a week later. 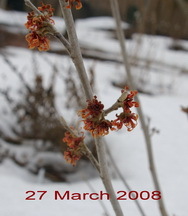 The snow is almost gone from the back garden and yet the Witch Hazel shows no sign of blooming. 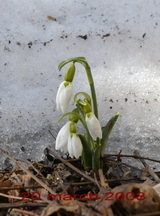 Last year, covered in at least 30cm of snow it started blooming on the 13th. My real problem is that I expect all of this to make some sense when Mother Nature is just doing her best to remind me who is in control. Knitting Eh?? 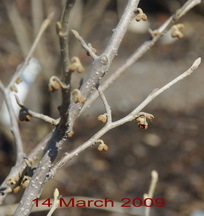 I have a couple of small fruit trees, a Peach and an Apricot which I pruned last fall. If I hadn’t, then now would be a good time to do so. Mine are situated at the ends of paths as a screen and thus I prune them almost entirely for shape and size but in so doing I also reduce the number of flowering branches, a bit of a loss. That does reduce the number of fruit that the tree tries to produce and that is the main object of pruning them. They attempt to be very prolific but if we reduce that volume then the remaining fruit will be larger and have a better chance of maturing. This is also the time of year, on one of those warm days, to spray them with a little dormant oil. It is the best organic method of controlling a range of pests that might bother them. Mine were new last year and they set a reasonable amount of fruit but little if any of it matured and this year I am going to see what I can do to increase that yield. I planted them as small screening trees but the production of a little edible fruit is a hoped for extra bonus. Stay tuned and you can learn along with me. The disappearance of the snow has revealed several things. In mid winter I wondered what I had done with last fall’s Parsnips. Now I know. I never did dig them up. Outside of reminding me of my aging memory, that’s actually a good thing because they overwinter wonderfully and I can go out in the garden as soon as it is a little bit drier and dig them up for our first meal from the garden this year. There are several other things out there that did not get cleaned up last fall that are now just a bit of a mess. 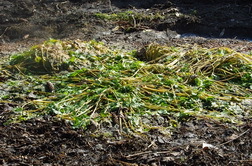 The Swiss Chard and one of the Celeries,(picture left) both of which stayed edible until the first hard frost are mushy reminders that, that frost, was accompanied by 20cm of snow that never melted. Clean up in the autumn is so much easier than it is in the spring. Tomatoes and Peppers are appearing daily in the basement. It’s a bit too early for the main crop of these but I need a few of each to grow into larger plants by planting time in my constant attempts to have those wonderful flavours on my plate as soon as possible this summer. Actually the first ones never see a plate; they just get picked and eaten right there in the garden. This week I will seed the earliest crops to go in the garden. Pak Choi, Rapini, Broccoli, Lettuce and similar vegetables love to grow in cool temperatures and those transplants need to be ready by mid to late April and that’s about 6 weeks from now. The Begonias that I have been working with all winter are getting quite large and they got a haircut this week, producing yet another crop of cuttings to propagate. 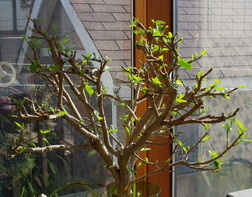 The butchered Hibiscus is magically turning green again. I have to admit that this is one of those secretly delightful “told you so” moments. There are always a few people who are aghast at what I do to this Hibiscus each year and swear that I have killed it. The new shoots burst from old wood and I get that delicious moment. Another unexpected delight from my few days tramping around central Florida on your behalf was the discovery of a great, well established, garden where I didn’t expect one. I have always been subliminally aware of the architectural jewel Bok Tower but never made any effort to visit it. 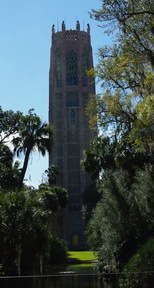 Well the proper name of this landmark is Bok Tower Gardens and as the name suggests the gardens are as impressive and important as the actual tower. If you enjoy visiting interesting gardens then it’s a delightfully restful and yet informative place to spend several hours. Paul Asks? This is my first winter with my new pond. When can I, or should I, turn the pump back on? Ken Answers! I could write a small book about the spring startup of ponds because there are so many variables. In my case where I have a couple of rivers and waterfalls, I have to be able to get them free of ice and the accumulated detritus of winter and the hose from the pump to the top of the waterfall must also be thawed out. Ideally if you are going to empty and clean your pond, not something I do very often, then you should do that before you start stirring it up with circulating water. My middle pond is desperately in need of a clean out this year as the lilies are now rooted in the 30cm of accumulated muck in the bottom. All that said, I like to get mine running as soon as possible and hopefully before the first of April.